Zojirushi vs. Tiger: Choosing Your Rice Cooker. Did you know that even seasoned and professional cooks use rice cookers? Rice cookers turn the (sometimes very tricky) task of making rice into an easy, hands-off activity. If you’re looking to make sushi rice or Asian rice, two top brands of rice cooker are Zojirushi and Tiger. Zojirushi vs. Tiger is a hot topic amongst sushi rice aficionados. You could spend all day reading forums and reviews about which is better. Both companies produce a variety of different rice cookers, which vary in price, size, shape, features, and technology. To help you determine which of these two brands of rice cooker is right for you, we’ve boiled it down to a few key differences that you should consider. So you’re buying a rice cooker because you want to cook sushi rice. But what about those times when you just want some good ol’ brown rice? Or when you want to cook multiple foods at once without dirtying every pot in the cupboard? 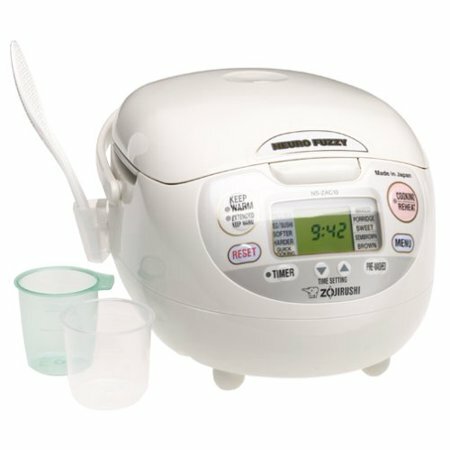 Zojirushi has rice cooker models that double as steamers, allowing you to steam fish or other foods while the rice cooks. Other ﻿Zojirushi models have cake settings that bake cakes. Tiger has added new slow cooker settings to its latest rice cookers, allowing you to create soups and stews, while another has a bread baking function. Bottom Line: Both Zojirushi and Tiger have rice cooker models that include setting for multiple types of rice and other foods. Before you commit to a specific Zojirushi or a Tiger, review all of the model’s features and functions. Since both Zojirushi and Tiger are top-notch brands for rice cookers, you won’t find a lot of customer complaints online. Both seem to have durable products with longevity. A review of each company’s product warranty information gave Zojirushi a bit of an edge over Tiger. Zojirushi does not require you to register your product after purchase in order to make a warranty claim; Tiger does. Zojirushi’s warranty claims to cover against “defects in materials and workmanship". If you haven’t registered your Tiger rice cooker and it breaks, your warranty may be null and void. Tiger also covers only the repair of the electrical components of its products. Both companies have one-year warranties. Bottom Line: If you are investing in a top-of-the-line rice cooker from either of these brands, you may want to opt for the brand that provides more warranty coverage, and that’s Zojirushi. Both Zojirushi and Tiger manufacture rice cookers with a range of technology, including conventional electric, microcomputer (also known as microm), and induction heating (IH). 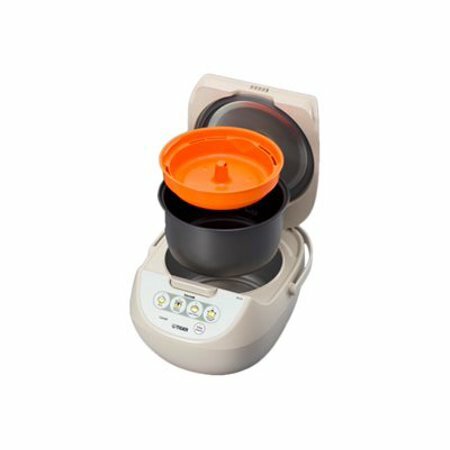 Zojirushi has added another new technology to it’s line with the Induction Heating Pressure Rice cooker & Warmer. 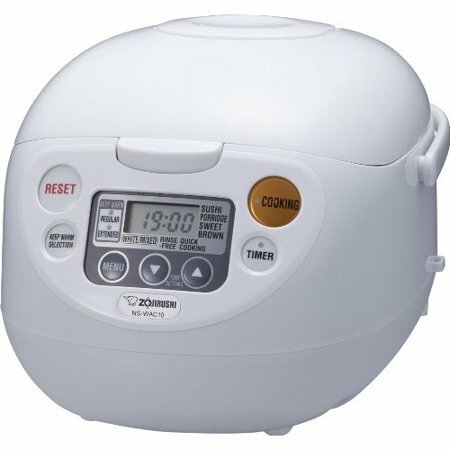 According to their website, this new rice cooker “elevates cooking temperatures to higher levels”, which results in softer rice that stays softer for longer compared to regularly cooked rice. Tiger has yet to release this latest pressurized technology. Both brands also offer what is known as fuzzy logic cooking options, Zojirushi calls this “Neuro Fuzzy”, while Tiger calls it their “Automatic Cooking Logic”. Fuzzy logic means that the rice cooker automatically senses and adjusts the temperature of the rice or other food that you are cooking, and adjusts it as necessary to produce the best quality food. Bottom Line: Zojirushi has a bit more technology up its sleeve than Tiger, but that only puts it slightly in the lead in this comparison. Tiger and Zojirushi sell rice cookers that are made in both Japan and China, so neither one wins this comparison. If the country where the parts were manufactured and assembled is important to you, be sure to check the specs of each model (from each brand) carefully. 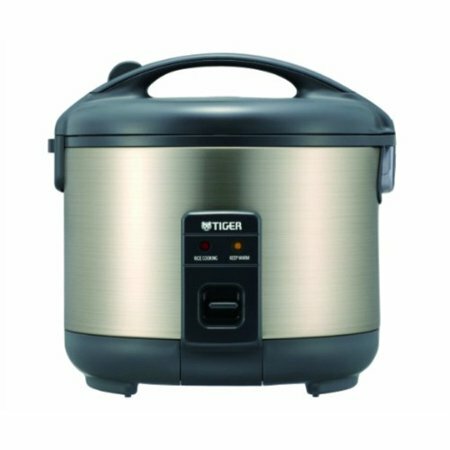 The Tiger Corporation JBV-A10U Micom Rice Cooker and Warmer will let you cook rice in a very easy way. It comes with a nice Tacook plate that will enable you to create simple entrees with the rice cooker as the rice steams below. It also comes with other innovative features such a four cooking settings for white rice, brown rice, jasmine rice, and other types of food. 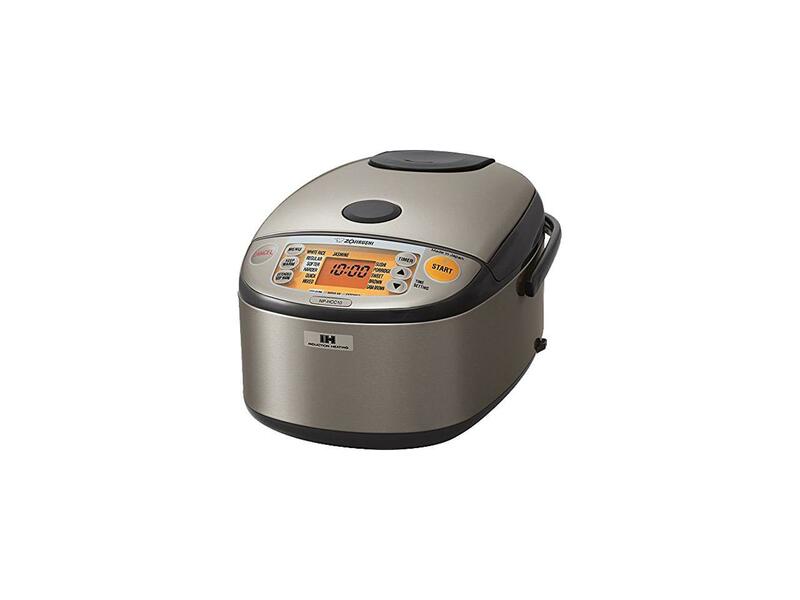 This rice cooker is a great choice for anyone who is looking for a machine that’s easy to use. This machine comes with a one push operation that will enable you to cook a batch of rice with just a single push of a button. Another great thing about this rice cooker is that it comes with a synchro-cooking function that will allow you to cook your entrée and rice at the same time. The Tiger JNP-S10U 5.5 Cup Rice Cooker will let you cook white rice without much effort. This model is very conventional, it will just bring you back to the basics of plain rice cooking. This rice cooker is also very easy to clean and maintain since it comes with a removable and washable steam vent as well as a non-stick inner pan. What’s more is that you can easily use it to steam vegetables, poultry, seafood, and other types of food. If you are like some people who are seeking for an easier way to cook rice, this rice cooker will completely enable you to cook a batch of rice that you don’t need to keep an eye on at all times. With a single push of a button, you will be able to end up with a nice meal. If you would like to get a machine that’s a bit more modern than most rice cookers in the market today, this one comes with a microcomputer that will provide you with 4 cooking functions and 10 pre-programmed cooking settings. 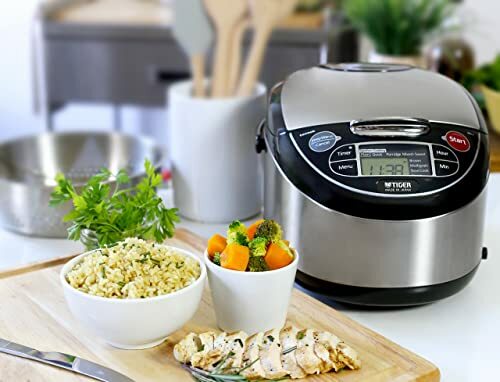 This rice cooker also monitors the whole cooking process, ensuring that your meal will be cooked the right way and will be up to your standards. It also contains a Tacook synchro cooking function that will allow your cooker to prepare two dishes at the same time. You don’t even have to worry about the flavors of the entrée and the rice mixing together since the Tacook function completely prevents that from happening. If you want something that’s easy to maneuver, clean, and handle, the Tiger JKT is definitely a rice cooker you should check out. Speaking of being in a rush, this rice cooker induction property will ensure that your rice will get cooked really quickly and evenly. The way this cooker works is that it uses a heating element to directly heat the pan up to its sides, ensuring that you get perfectly cooked rice every time. This rice cooker comes with several cooking functions that will let you personalize its settings to completely meet your personal preferences and needs. 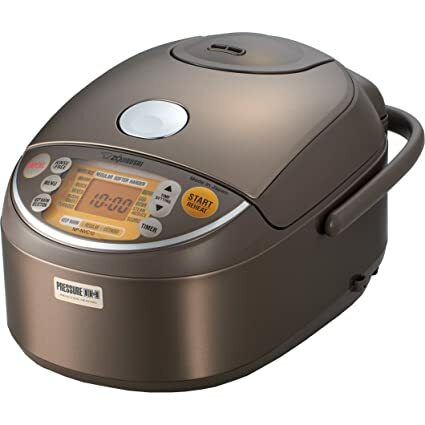 You can set this rice cooker to cook a multiple types of rice including brown rice, jasmine rice, white rice, and mixed rice. 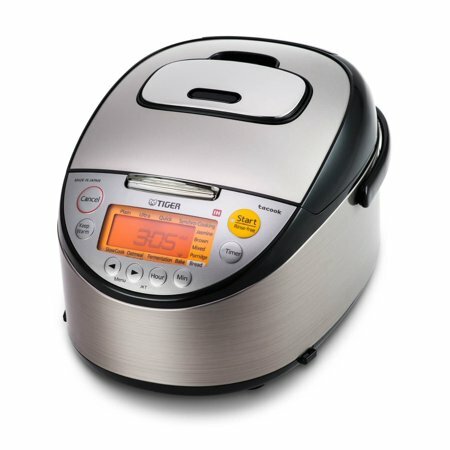 You can also use this rice cooker to prepare different types of food such as oatmeal or porridge. Needless to say, this rice cooker is a great machine that you can use to make a fine breakfast for yourself or your family. This rice cooker also comes with a fine menu that is very easy to understand. All you need to do is select your preferred cooking setting from the eight listed in the menu and the rice cooker’s Micom chip will communicate your selection to the rice cooker’s software to adjust the heat, required power, and cooking time. If you want to get a rice cooker that can last you years, this rice cooker that’s made with 3-layers of metal will surely meet your expectations. If you are looking for something that can quickly make you fluffy rice, this Zorijushi rice cooker may be the right choice for you. This rice cooker can cook batches of rice really quick because it is an induction rice cooker that’s able to heat up faster than conventional ones. Aside from being able to cook rice really quick with its induction technology, this rice cooker can also save you a lot of bucks. Its induction technology is actually more efficient despite being able to perform the same way as gas powered cookers can. Apart from being a really efficient rice cooker, this one also comes with several sets of cooking functions. The multi-menu functions allow you to prepare a variety of different rice and porridge (grain cereal) types. Those varieties include; white, brown, jasmine, mixed, sushi, etc. This rice cooker is very modern since it comes with its own micro computerized fuzzy logic technology that will ensure you get perfectly cooked rice every time. What’s great about this rice cooker is that it has a dimension of 14 x 10.1 x 8.5 inches. But despite its compact looking design, it can easily accommodate enough rice that you can serve for a large groups of people. Other useful features of this rice cooker is its keep warm function, reheat cycle features, and extended keep warm that will help you get warm rice out of your cooker every single time. This rice cooker is also very easy to clean since its exterior is made with stainless steel that you can easily wipe out. Aside from the exteriors being super easy to clean, its inner cooking pot is also easy to clean since it’s made with aluminum materials with a fine Teflon coating. However, since Teflon is an easily scratch-able material, you may find it a bit hard to maintain. The Zojirushi NS-WAC10-WD 5.5-Cup (Uncooked) Micom Rice Cooker can offer you multiple cooking functions ideal for mixed rice, sushi rice, white rice, sweet rice, porridge, rinse-free cooking, and quick cooking. A lot of user reviews on this machine has been really positive because of the preset functions that allows them to cook pretty much any kind of rice, especially tough ones like brown rice. If you cook plenty of rice all the time, this 5 and ½ capacity rice cooker might be the best one for you. With this rice cooker, you will be able to cook a batch of rice for 6 up to 8 people with ease. 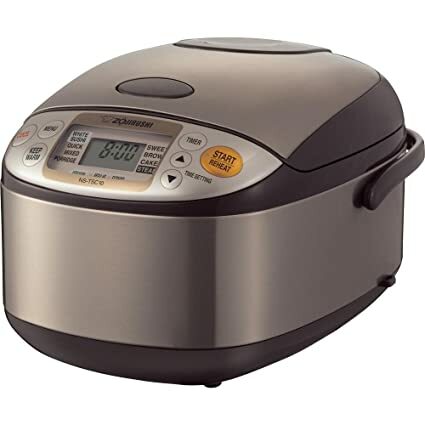 Other useful features of this rice cooker is its keep warm, extendable keep warm function, and timer option. These heating functions once activated, will keep your rice at optimal heat levels without overcooking your rice. The timer option on the other hand, will enable you to set a time for your rice cooker to automatically start the cooking method without the requirement of your supervision. This is also a highly-celebrated function by many users because it has been really helpful in times of multitasking. If you are looking for a small rice cooker that can help you make fluffy rice for two people or a small group, this rice cooker will surely help you get the job done. What’s great about this rice cooker is that it comes with an LCD screen that’s very easy to read and navigate. It also comes with an automatic keep warm function that can be very handy if you want warm rice right out of the cooker at all times. What’s more is that this rice cooker completely eliminated the need for monitoring and stirring. 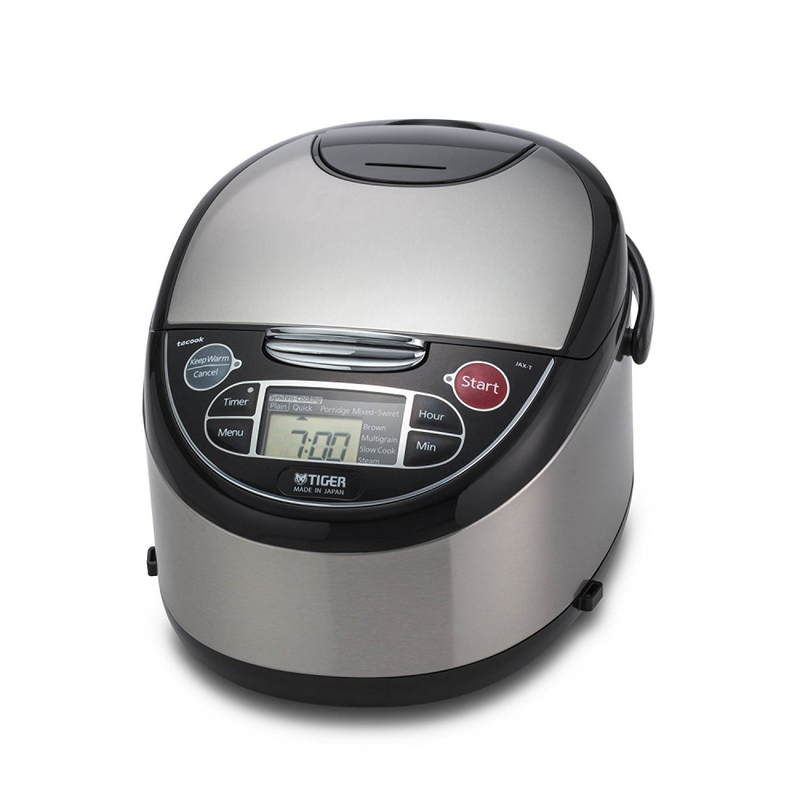 The technology contained within this rice cooker will completely ensure your rice is flawlessly cooked without lumps. This rice cooker also comes with its own smart technology that will make sure your rice or the other food you cook in your rice cooker will be cooked under the perfect temperature within the perfect time span, significantly reducing food wasted because of being burnt. This feature of the cooker can also save you a lot of time and can offer you flexibility since it doesn’t require any monitoring. 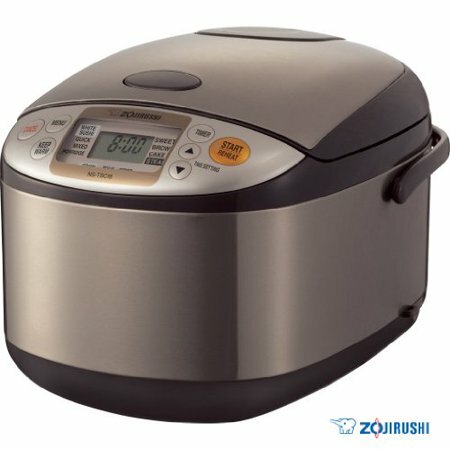 The Zojirushi NS-ZCC10 is another Japanese rice cooker that has garnered a number of positive praises from its users. If you are looking for a rice cooker that can count as a great investment, you should definitely add this one to your list. One of the main reasons why this rice cooker has become well known in the market today is because it’s equipped with Zojirushi’s trademark Neuro Fuzzy logic technology. 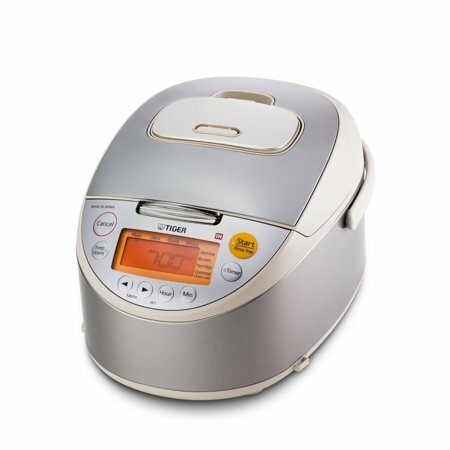 This rice cooker’s computer chip adjusts both the temperature and cooking time to optimal levels to ensure you get perfectly cooked rice every time whether it’s sushi rice, brown rice, white rice, sweet rice, or even porridge. This is also another large capacity rice cooker in this list. This rice cooker can easily accommodate 5 and ½ cups of rice. You can also keep large quantities of rice really warm even after hours of resting because it comes with an automatic keep warm function along with an extended keep warm and a reheat cycle. Investing in a rice cooker can simplify your meal prep, but choosing one is clearly not so simple. Zojirushi edged out Tiger in terms of technology and warranty coverage, but only just slightly. Here are the key questions you need to ask yourself to choose between Zojirushi vs. Tiger. 1. How much versatility do I need in my rice cooker? 2. Do I want to make many different kinds of foods? 3. How important is it to me to have the best technology? 4. 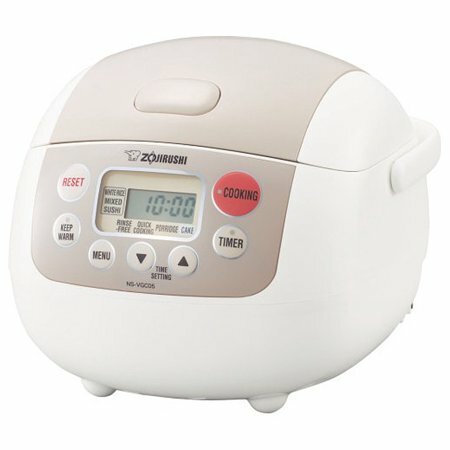 If my rice cooker breaks, will the manufacturer pay for the repair/replacement? 5. Do I want a rice cooker that was made in China, or one that was made in Japan? If you have more questions about Zojirushi vs. Tiger, leave it in the comments below and we’ll do our best to assist you.